Well, they were made over a long period of time! But thanks! Candies that last forever…like plastic! 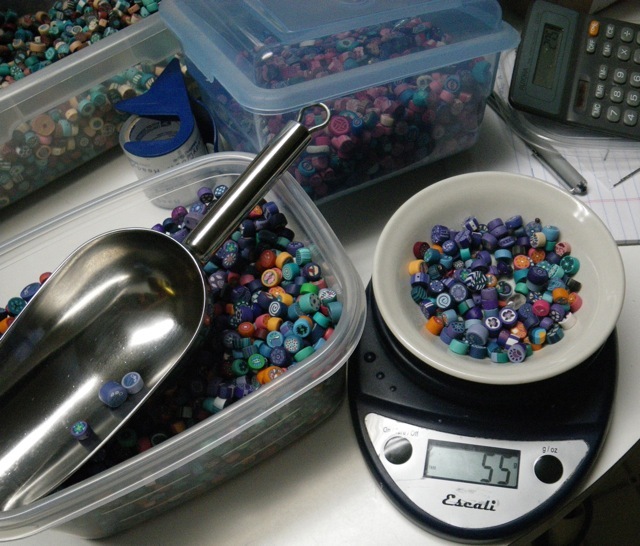 That’s a lot of beads! I love these photos. Where cd we get good quality clasps? And whatever they get strung on? Last forever like plastic? Not at all like plastic (which melts nastily). An archaeologist who found things made of these wd be thrilled – even just one of the containers full of unused ones. Sally, I’ll get back to you with a longer answer. I’m off to catch the 8:15 boat. 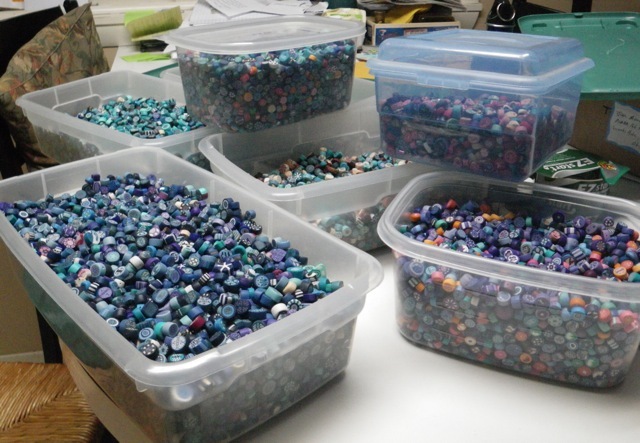 I think there will be plenty of beading supplies for sale at the show. ie. Clasps and stringing supplies. In polymer clay, the word “cane” refers to a glass technique, where glass blowers pull a piece of hot glass into a long cane. with polymer, you start with a thick log of a design and roll it into a thinner longer log or cane. The design inside stays intact but reduces in size. 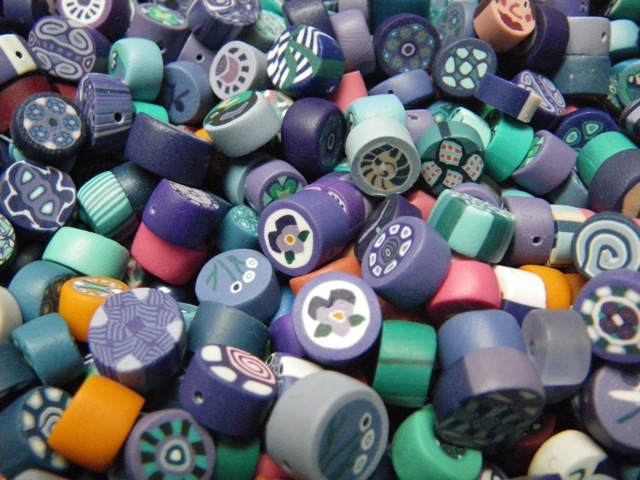 All those itty bitty bead designs started out as a short thick cylinder. 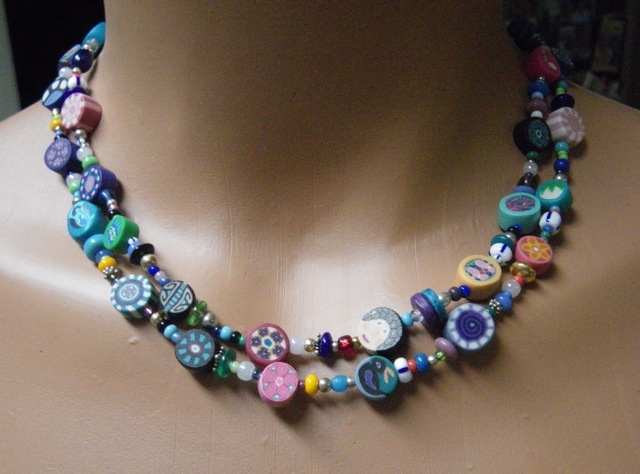 Your beads are gorgeous and I’m sure they will sell. I also know about the nervous and that will never go away, so just act like it’s all fun and if you sell something (which you will) it’s gravy!!!! I know you know! It’s all part of the show. just WOW. i had no idea. Stuff from a long time ago. Barb, not that I like when others have insecurities, but it’s nice to hear that someone that I look up to and whose work I greatly admire has the same insecurities. We often think everyone around us “has it together” but I think there are more people than we know that feel this way. It’s so nice to see you and your beautiful stuff at the show! I hope we both have a LOT of customers today. see you there! Great to see you, as usual. I love the idea of selling supplies at a venue like this-it’s a great way to connect with other bead/jewelry people! It was really nice to see you there too. I should have called you earlier, then I would have known just how much of a bead venue it was. D’oh. 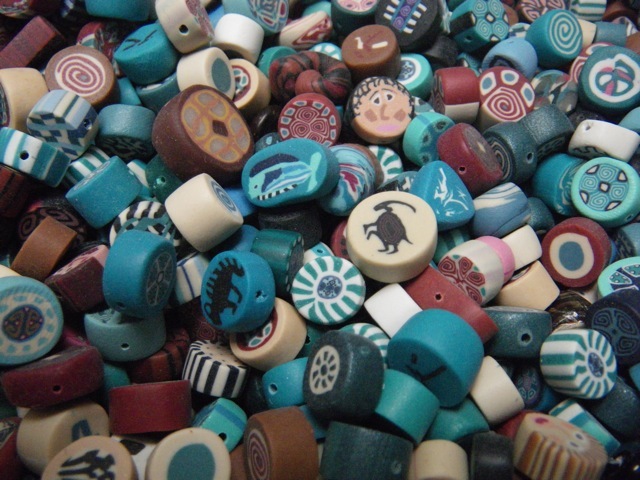 I had a good time and I wish I could see what people make from the beads they bought from me. I will definitely do it again next fall. If I get the clam shell /seed bead piece done, I’ll send you a photo! I just hope to get into the studio at least one day this week. Between my mom’s appointments and mine I have to be off island on Wednesday, Thursday, and Friday. Argh! Maybe next week…….